By 1751, St. Philip’s was again too small for its flock so a larger structure — named St. Michael’s — was built on the original church site. Building began in 1752 and was completed in 1761 the church is constructed of brick and stucco. Except for an addition in 1883 the building has not changed much in 250 years. 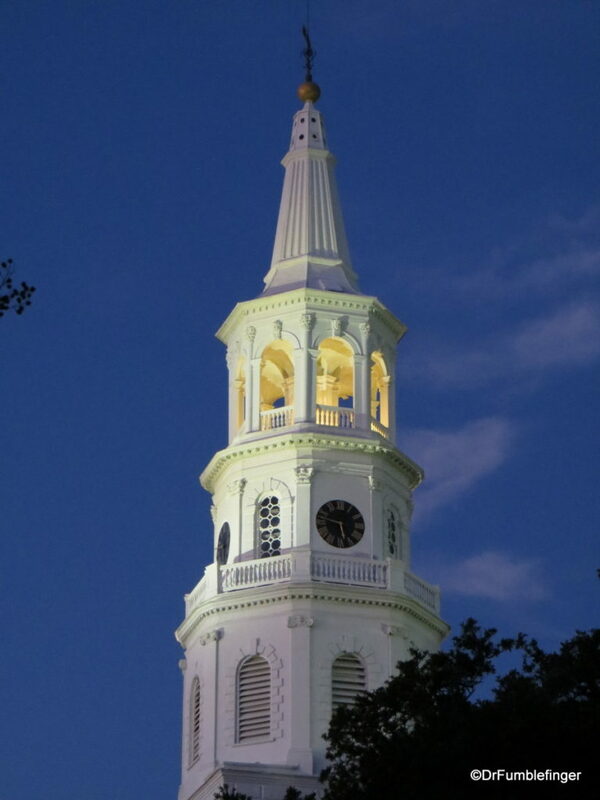 St Michael’s steeple is 186 feet tall and contains 8 bells imported from England (1764). The pulpit is the original one. The organ was made in London and installed in 1768. The building has survived a number of hurricanes, even an earthquake in 1886 and a tornado in 1938. The church has had its share of dignitaries worship here, including President George Washington and General Robert E. Lee. Visitors are welcome to explore this lovely sanctuary, as did we when we visited.